Foil Tapes | J.V. Converting Company, Inc.
An all weather aluminum foil tape for general purpose use. It is a dead soft high tensile 2 mil thick aluminum foil coated with an aggressive acrylic adhesive system on a removable paper liner. Its malleable foil conforms well to irregular and curved surfaces; and will perform well at both low and elevated temperatures. It can also be applied at low temperatures. JVCC AF20 Foil Tape is used for vapor barrier protection, waterproof sealing, heat reflection & dissipation, masking in paint stripping and electroplating, and sealing plastic automation plateware for use in biotechnology research. The wider width 3 and 4 inch is also used to cover over and seal seams in Hexayurt shelters. A 1 oz. 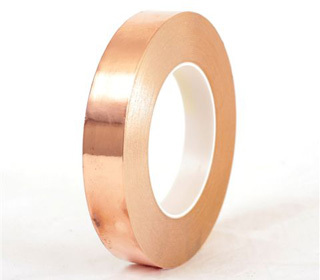 rolled copper foil which provides excellent solderability and conformity. Used for RFI/EMI (electromagnetic interference/radio-frequency interference) shielding applications in the electrical/electronics industry (used to shield integrated circuit chips, cables and motors). CFL-5CA is coated with an acrylic adhesive which is uniformly dispersed with conductive spheres. Its conductive adhesive is ideal for printed circuit board modification, security-alarm circuit repairs, and prototype wiring-board layout and design. Also for cable wrapping to provide EMI/RFI shielding, seaming of EMI/RFI shielded rooms for electrical continuity, static charge draining and for surface contact to non-solderable materials (e.g. aluminum or plastics). The copper foil sheet resistivity is 0.003 Ohms/square inch. Its aggressive acrylic adhesive system creates a superior bond. Annealed and non-tarnishing, bright copper color. Flammability: File #130121, UL 510, Section 4. Can also be used for decorative arts & crafts projects.